Selecting Suppliers presents a list of all suppliers and relevant information associated with each. Clicking on a column heading will sort the listing in that order. Clicking again on the same heading will switch between ascending and descending. In the image above, the listing has been sorted by clicking on the Products Supplied column. Supplier code; click on the supplier code to set the stated lead time, the default look forward days and to add a comment against the supplier. View the lead time to each of your locations and navigate to the supplier's performance. Products supplied; click on the number of products supplied to view a listing of all products that are supplied by this supplier. Open purchase orders; click on the number of open POs to view order number, order date, order quantity, outstanding quantity (still to be delivered) and other order details. 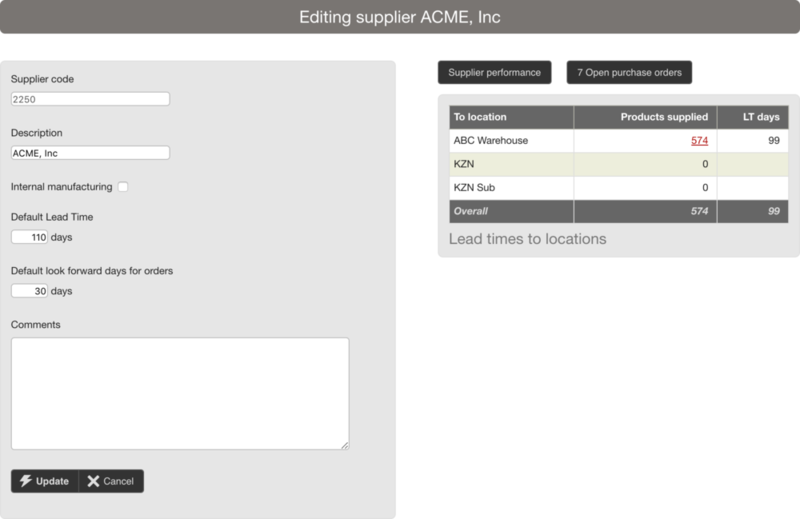 Use the Filter options to reduce the number of suppliers displayed in the listing. This can be quite useful when searching for a particular supplier, suppliers with open POs, or items with long lead times, for example. You may also indicate whether this suppler is used for internal manufacturing or not. Checking this box results in the creation of work order files (wo_###.csv) instead of purchase order files (po_###.csv). Please note: this internal manufacturing flag does not apply to all order formats. Be careful when maintaining lead times here by supplier: if supplier lead times are imported, any changes made here will disappear when next the data is refreshed. Clicking on the Products supplied in the supplier listing will display all products supplied by this supplier. 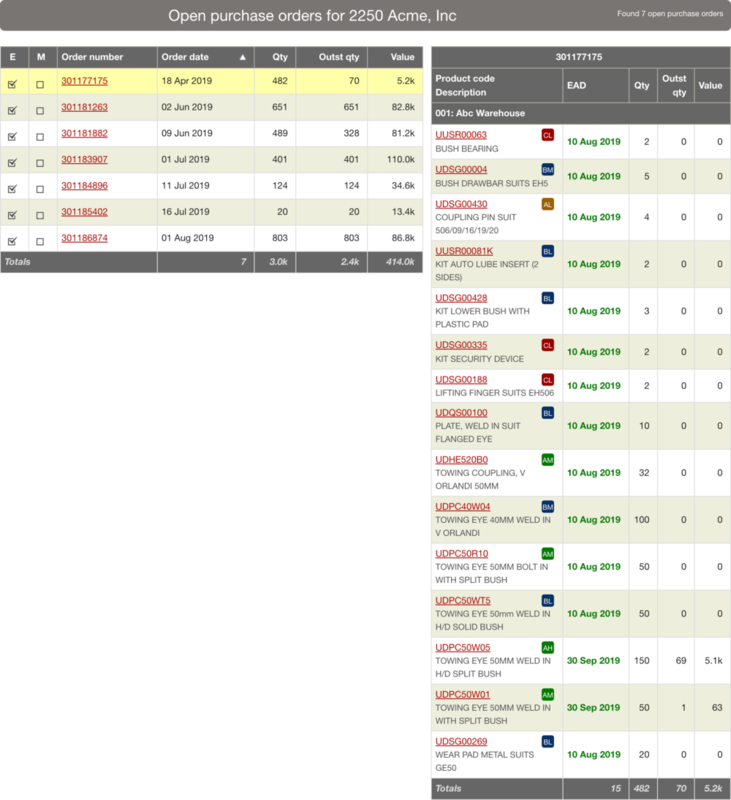 Clicking on the Open purchase orders in the supplier listing will display the currently outstanding purchase orders. 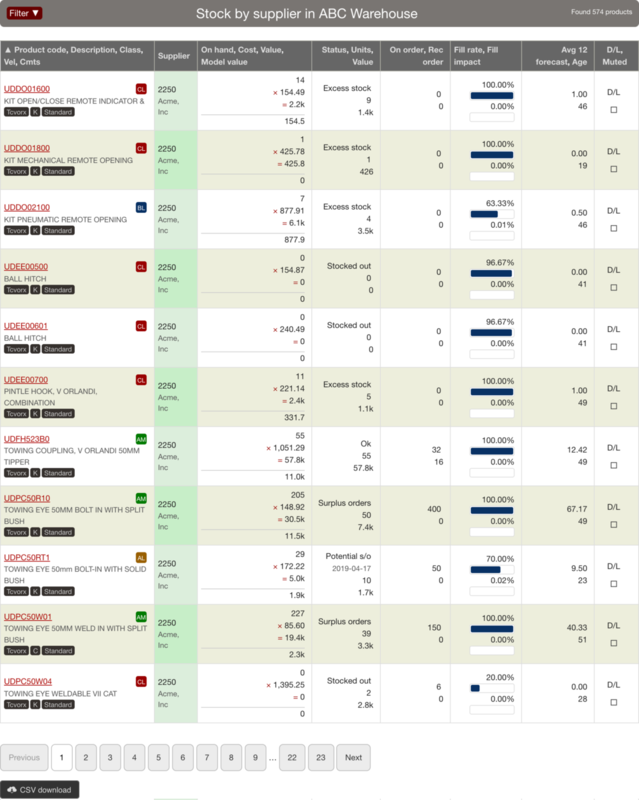 Clicking on the Order number of a purchase order, displays all of the products on the order. 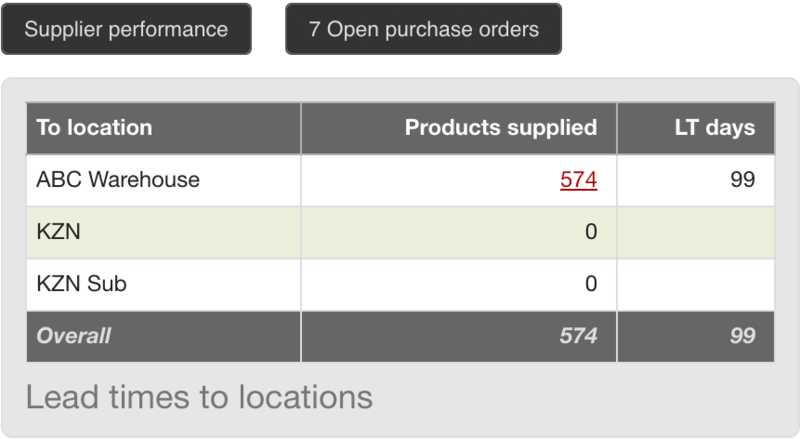 Note: You can also navigate to the open purchase orders by clicking the open purchase orders button in the supplier edit.